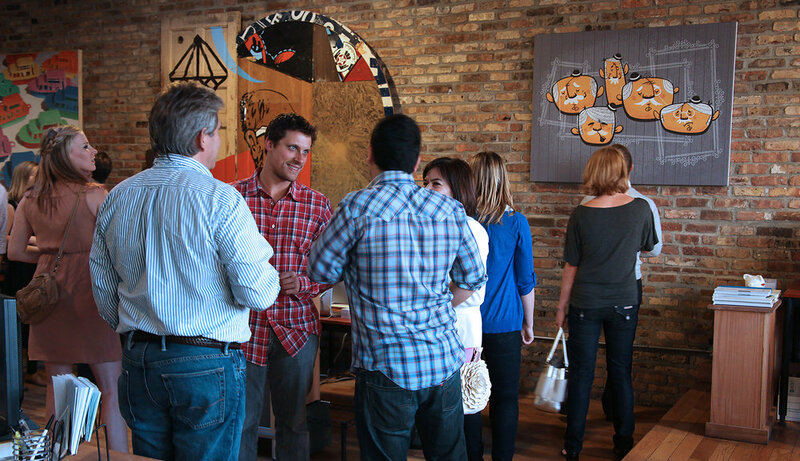 In 2011, eight members of Gorilla Group’s creative team set forth to stay connected to Chicago’s local art scene as many of them had backgrounds in printmaking, painting, photography and music. As a result, the team convinced the company to fund a passion project to conduct a local “Call for Artists” application process, commission those artists and host an event celebrating the newly created pieces. 60 applicants later (we selected five) and a cover page write up in the Chicago Reader (see below) provided us with signals that we were onto something worth pursuing. This project would affectionately be called the Prime Eight Art League. Here is the first promo video from our local “Call for Artists” application process back in 2011. It’s definitely rough around the edges but then again so were we. For the next six years we continued to improve the application process, partnered with strategic brands/companies and leveled up the experience of being part of the Prime Eight Art League ecosystem. In 2016, we hosted our most ambitious fundraising event at the House of Vans in Chicago showcasing artists from around the world, live painting, big ticket raffle, live entertainment and more (see recap below). All proceeds from the evening went to our great friends and official NFP partner Marwen. In 2017, we shifted gears and sunset the application process to pursue the service offerings of creative consultation and creator representation. As a result, we have been privileged to work with brands like Facebook, Instagram, Vans, New Era Caps, Brooklyn Boulders and more. Connect the creator community with influential brands, technology shops and creative agencies as a means to activate, inspire and challenge the private sector. Our events showcase art from the creator community, live entertainment, food, refreshments and a big ticket charity raffle. All proceeds generated from our events are donated to Marwen, an organization dedicated to providing visual arts instruction to under-served youth throughout the Chicago area. © 2019 Prime 8 Art League LLC. All Rights Reserved.